Nick Livengood '12 L'15 learned many valuable lessons from his parents, including the importance of giving back to organizations and institutions that make a difference. Recently, Livengood honored those wise teachings by making a generous estate gift to support the programs that meant the most to him as an Elon student. "I had always considered making a planned gift, just as my parents have done for their respective alma maters," Livengood said. "It was one of those things that you just do." 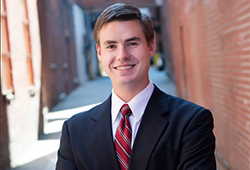 Livengood is a double Elon alum, having earned his undergraduate degree in political science in 2012 followed by his degree from the Elon University School of Law in 2015. He valued his relationships with the faculty and the experience he gained at Elon Law and the university as a member of the Student Government Association and Interfraternity Council, among other campus organizations. "I really enjoyed my time at Elon and cherish it, and this was a good opportunity for me to give back to the school that has given a lot to me," he said. "My involvement at Elon as a student and after I graduated showed me the importance of giving back. It not only strengthens the university, it gives your degree more value." Livengood placed Elon in his estate by making the university the beneficiary of an IRA that he inherited following the death of his father, Dr. Charles Harris "Nick" Livengood III, last year. Future proceeds from his gift will support the history and political science departments and/or the Student Government Association. Today, Livengood works at Real Estate Associates in Durham, N.C., where he's able to leverage his law degree while also doing commercial brokerage work. "I am really enjoying it and think Elon prepared me incredibly well," he said. "There are so many ways to make a difference at Elon and to get involved with an organization from a leadership position and to shape what that organization does. Those are opportunities that I don't think you get at other schools. At no point did I ever feel like just another student." For many donors, estate gifts enable them to make their biggest philanthropic impact at Elon. Livengood said making his gift was "easy to do." "It was a five-minute process, filling out a form and sharing it with Elon," he said. "It makes you feel good knowing that after you're gone, you're still going to be helping your school and helping to create memories for the next generation. I want to make sure that Elon remains a strong, thriving university."